In the assessment of possible crack growth in structures such as power plants, heavy machinery and airplanes, the computation of stress intensity factors along 3D cracks using linear elastic fracture mechanics is extremely important. Traditionally, the J-integral and stress intensity factors are calculated using a virtual shift technique based on nodal point virtual shifts, in which a mapped mesh is required around the crack front. However, for complicated components, it is frequently challenging to construct a mapped mesh around the crack front. Calculation of mixed-mode stress intensity factors, for linear static analysis without thermal effects. J-integral and stress intensity factors can be output at the corner nodes on the crack front, or output at equally spaced locations on the crack front (crack advance stations). Mapped or free-form meshing around the crack front. One or more cracks in the model. Geometry-based or element-based crack definitions, with minimal user input. All of the virtual shift definitions shown in a single plot. Because it is not necessary to construct a mapped mesh around the crack front when the SVS method is used, the amount of effort required to perform linear elastic fracture mechanics analysis is considerably reduced. One fundamental idea used in the SVS method is that virtual shift domains are mesh-independent. As a consequence, when the fracture results are output at equally spaced crack advance stations, these stations are also mesh-independent, thus as the mesh is refined, the fracture results can be expected to become more accurate. We illustrate the use of the SVS method with a 3D fracture mechanics problem already solved with ADINA Structures in the February 2012 Tech Brief. In the February 2012 Tech Brief, the meshing is somewhat complicated, due to the need to use a mapped mesh on the crack front. In addition, only the J-integral (and not the stress intensity factors) are calculated in the February 2012 Tech Brief. In the current Tech Brief, we use the SVS method. This allows us to use a free-form mesh everywhere, and to calculate both the J-integral and the stress intensity factors. The cracked model is constructed as illustrated in the following figures. Figure 2 Nozzle without any crack. The ADINA-M module of the AUI is used for the geometry definition. Figure 3 Crack front line and the crack body (body that will eventually contain the crack). 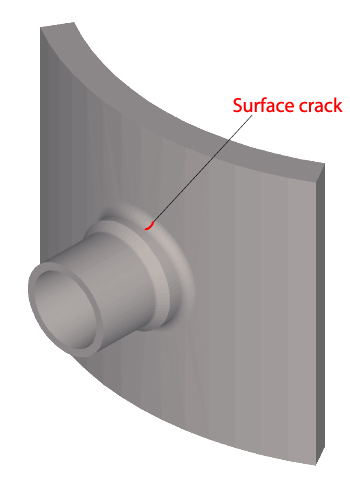 At this point in the model definition, the crack body partially overlaps the nozzle, and the crack front line extends outside of the nozzle. Figure 4 The result after intersecting the crack body with the nozzle body, and subtracting the crack body from the nozzle body. The crack body is trimmed to the nozzle geometry. Figure 6 The result after projecting the crack front line onto the faces of the top and bottom crack bodies. The projection creates two faces for each body on the common boundary between the bodies. of the AUI are used for both meshes. Figure 9 The cracked bodies mesh along with the geometry faces on the boundary between the top and bottom cracked bodies. The cracked bodies mesh is split at the cracked faces (dark green in the figure), using the new MESH-SPLIT command of version 9.1 (see the ADINA Handbook for more information about MESH-SPLIT). Figure 10 Rotated view for Figure 9, same view as in the following figures. Specification of 10 equally spaced crack advance stations along the crack front. Specification of 3 radial domains at each crack advance station, and the radius of the outermost radial domains. The geometry faces corresponding to the cracked faces on the top and bottom crack bodies. Figure 11 shows the SVS virtual shifts created by the CRACK-SVS command and Figure 12 shows the SVS virtual shift symbol. Figure 13 shows some of the elements near the crack front along with the virtual shifts. The SVS domains are independent of the meshing and the crack advance stations do not coincide with nodes. The results for the first and last virtual shifts are not shown, since these virtual shifts correspond to shifts at the end of an open crack front, and the results from these shifts are not as accurate as the other virtual shifts. One reason for this inaccuracy is that the virtual shift domains for the ends of the open crack front are not entirely contained within the mesh. The J-integral values are in very good agreement with the results given in the February 2012 Tech Brief. The stress intensity factor results clearly show that mixed-mode conditions are present on the crack front. Both the J-integral values and the stress intensity factor values are nearly independent of the radial domain chosen. Clearly the SVS fracture capabilities of ADINA System 9.1 represent a significant advance.